"Many years ago, I ran out of Miracle Whip® while making potato salad and added coleslaw dressing. I wouldn't make it any other way now. This can be eaten the same day, but is best the next day." Place potatoes into a large pot with enough salted water to just cover; bring to a boil, reduce heat to medium-low, and simmer, turning occasionally, until fork-tender, about 20 minutes. Drain potatoes and set aside to cool. Place eggs in a saucepan and cover with water. Bring to a boil, remove from heat, and let eggs cook in hot water for 15 minutes. Remove eggs from hot water and rinse with cold water until cool. Peel and chop eggs; put into a large glass dish. Peel cooled potatoes and chop; add to eggs in glass dish. Stir coleslaw dressing and creamy salad dressing together in a bowl until smooth; add chives and stir. Pour dressing over the potatoes and eggs; stir to coat. Season salad with salt and pepper; dust with paprika. 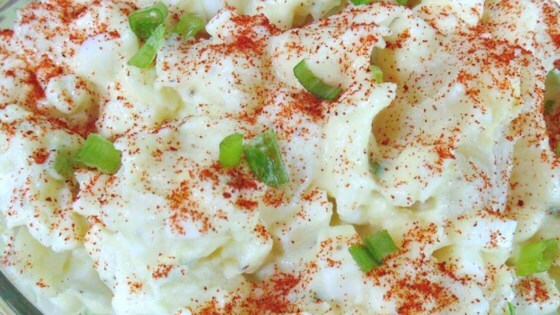 This creamy potato salad tastes delicious chilled. This potato salad was really creamy and really delicious. I would definitely make it again.